Experience one of the most vibrant cities in Europe with an English course in Dublin! You’ll find friendly faces everywhere you look in this city of street musicians and never-ending nightlife. The Guinness Storehouse, where the famous drink is brewed, is a popular destination for tourists, offering perfects pints and panoramic views of Dublin. From here you can see the glistening River Liffey, winding its way through Dublin’s busy shopping streets and beautiful church steeples. Watch Gaelic football or Hurling at Croke Park stadium, or track down great literary figures at the Dublin Writers Museum. Dublin and the surrounding area is soaked in history, with the 5000 year-old burial mounds of Newgrange within easy reach. The impressive Trim and Malahide castles are just north of the city and are well worth a visit. Malahide is also blessed with stunning beaches, which are perfect for unwinding after your English lessons. The school is located in south Dublin, in an old Victorian mansion with its own gardens. Looking out onto picturesque parkland, it has 25 bright and comfortable classrooms; two language laboratories; more than 20 computers with free Internet access; a cafeteria; well-stocked library; study room; and student common rooms. If you have your own laptop, you can also use the wireless Internet connection, completely free of charge! Our Standard English course in Dublin covers every aspect of the language: speaking, listening, reading, writing and grammar. There are 20 English lessons each week and they run from 09:00 to 13:15, Monday to Friday, so you can spend your afternoons and weekends getting to know Dublin! If you want extra time to perfect your speaking skills and pronunciation, the Intensive course is perfect. It offers 20 regular lessons each week, as well as six conversation classes in maximum group sizes of just eight students. For a course completely tailored to your needs, choose Private Lessons to learn English in Dublin. You’ll agree the course content and the course timetable with your teacher, giving you complete flexibility. Alternatively, you can choose a Combined course, offering both group and Private English Lessons. Individual classes allow your teacher to devote all of their time to raising your level of English, so the more classes you can take, the more progress you will make! Our school’s Business English course includes six lessons each week with a maximum class size of only six students. These six lessons focus on English business terms and business practice, with the remaining 20 classes per week covering general English. The Business English program is a great way to better understand the English-speaking business world! Other special interest courses are also available at our English language school. Amongst them are the Cambridge Exam Preparation course, English for Primary School Teachers and English for Secondary School Teachers. Whatever your requirements, we’re sure to have the course for you! If you’d like further information on any of our English courses, please do not hesitate to contact us – we’ll be happy to help! Experience the hospitality and friendliness of the Irish for yourself – stay with a local host family! Our school takes great care when selecting and checking host families, helping you to enjoy your English course in Ireland as much as possible. Host family accommodation includes two meals per day, with executive hosts also providing private bathrooms. Living in an English-speaking environment, your language skills will rapidly improve! Alternatively, you can live with your fellow students on a self-catering basis, either in a residence or university halls. Our school’s residence is located in the Stillorgan suburb of Dublin, 30 minutes away from the city centre. The residence has a fully-equipped kitchen, shared bathroom and laundry facilities, two large lounges, free Wi-Fi connection, a study room and a daily cleaning service. For a slightly higher standard of accommodation and on-site tuition, choose our university residence, available during July and August. It’s located just outside of the city centre, close to the canal, amongst beautiful landscaped gardens. The shared kitchens are well appointed and there are laundry facilities on-site, as well as a large restaurant. Each apartment has two bedrooms (mostly twin rooms), two bathrooms (one en-suite) and a lounge, complete with satellite TV. Some single rooms are available, but are always in high demand, so book early if you want a single room! Make the most of your time in Ireland with our school’s packed activity program! 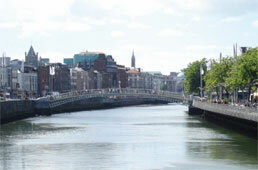 Typical activities include guided tours of Dublin and Dublin Castle, trips to the National Museum and English language film nights. Activities such as these give you the chance to meet your fellow students and practice your English outside of class! Our school also organises optional excursions for the weekends. Visit the beautiful gardens of Powerscourt; follow in the footsteps of the Pope at the monastery of Clonmacnoise; or taste traditional Irish whiskeys. If you want go further afield and see the natural splendour of western Ireland, two-day excursions are also on offer. One trip takes in the exciting city of Galway and the fascinating Aran Islands, whilst another focuses on historic Bunratty Castle and the incredible Cliffs of Moher. Please note that, as with all of our schools, there is usually an additional charge payable directly to the school for the activities. Airlines from all over the world fly to Dublin Airport. If you like, our school can collect you from the airport upon your arrival, taking you directly to your accommodation. However, this service does carry an extra cost. The teachers are very good. They give to the students exercises where they have to talk a lot with their clssmates...This is very good to learn language... Then they are always kind and helpful.